Boats and boat-design have fascinated me for quite some time. There simply is no more interesting mix of art and science in existence. Nothing more likely to generate a good discussion about form and function, all mixed up with adventure, adrenalin, tradition and good living! 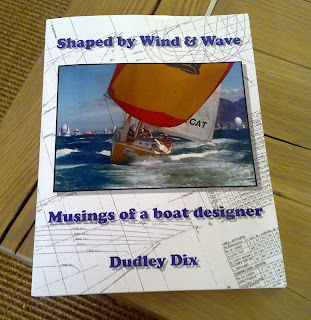 I was therefore very happy to receive a copy of Dudley Dix's new book - in which he explains his personal perspectives on design priorities, and how they have been formed through his own experiences of living, sailing, and boat building in the "Cape of Good Hope", a.k.a. Cape of Storms! Isn't it all done by computer these days? Err- no. When a yacht designer finishes at Westlawn or University or similar, they can tell how it float, balance and eprform, and not break hopefully, (plus a good few examples of good practise), but the philosophy and style of their designs is very much a product of personal creativity and personal values . . . This is what Dudley's book is essentially about - what his values and priorities on yachts and boats are, and the sensible design techniques for meeting them. All this is underpinned from the perspective of an ordinary man working on a budget, maybe home-building. 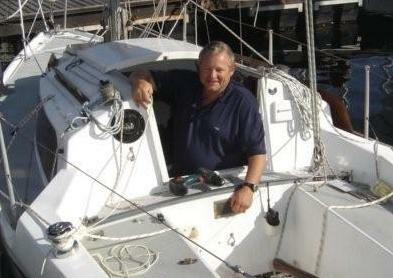 Much of it is related to his personal experience of growing up and sailing in the very challenging waters off the Cape of Good Hope, of dinghy sailing in the fresh winds of Zeekoevlei as a kid, his passion for surfing, and the experience of building his own keelboats. Then it goes on to how his career as a designer took off following the success of his first design "Concept Won" - which gained him a major international award, and gave him a basis for many of the very successful designs that followed. As someone who has good experience of some Dudley's boats (ref the rest of this blog! ), and has sailed in the same waters, I was able to relate directly to all of it, and was compelled to read the whole book from start to finish in just two days (its quite a lot of book). As a reference book, the content is simple and very easy to read, ideal for the ordinary yachtsman or boatowner. It is not full of mathematics, rather it explains the elements of yacht design at a practical and concept level. It won't make you a designer, but it will give give you a very good insight into the elements of yacht design, including hulls, rigs and most inbetween. For prospective and amateur boat builders, it is a must - with great chapters on choice of material, building techniques, even options for turning the hull. For anyone sailing around the south tip of Africa (common these days), Chapter 18 is a must. This is a fine piece of reality, concise but sobering, and for some folk will justify the book on its own. 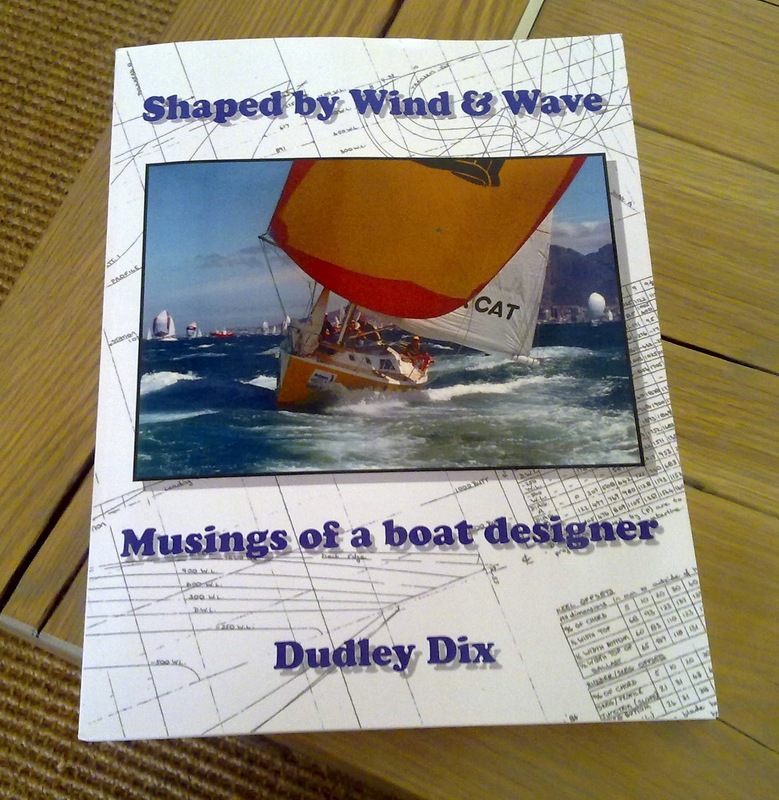 There is also a chapter on Ant Steward, the only man to who sailed around the world on an open boat one of Dudley's designs - a modified TLC19. Certainly Dudley cannot be blamed for this idea - Ant was on his own with this umm - amazing endeavour - but Dudley is uniquely placed to describe this feat, which must rate as possibly the most daring sailing challenge ever undertaken, along with the strengths and limitations of the boat used. In my opinion, there is nothing quite like this for bringing out the real priorities and needs of a sailing boat on rough waters . . . . its not called "Shaped by Wind and Wave" by accident! It now has pride of place in my boat library, right alongside Dave Gerr's "The Nature of Boats", Adlard Coles (Peter Bruce) "Heavy Weather Sailing", Tom Cunliffe's "The Complete Yachtmaster", Joshua Slocum's "Sailing Alone around the World", and Frank Robb's "Handling Small Boats in Heavy Weather" (even though it is a bit dated now). I have dozens of others but these are the "must reads". At USD 30 its very reasonable - copies are available from lulu.com - details on Dudley's website at www.dixdesign.com. An e-reader version is also available now. 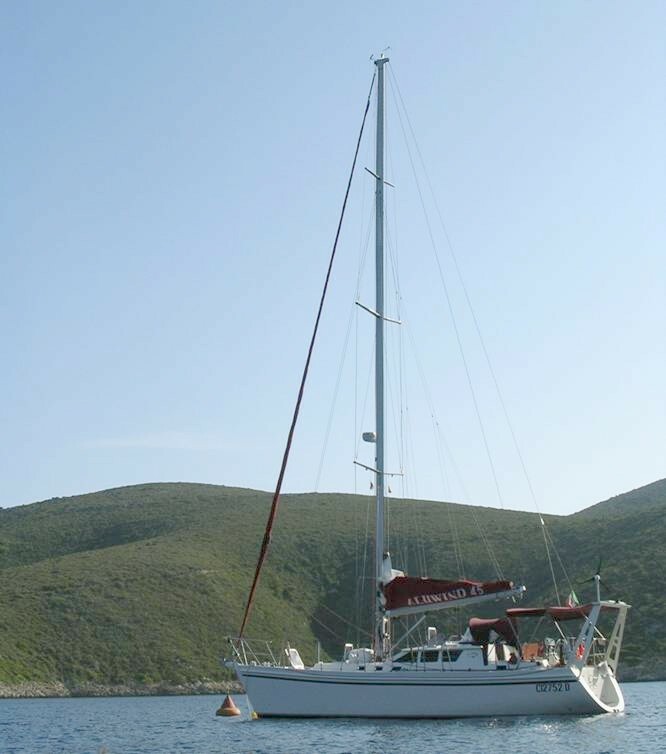 The Vickers 45 is another great cruising yacht with a strong Hout Bay connection. Designed by Dudley Dix, a great example was "Tantalus/Sweetwater/Vlakvark" - a Vickers 45 AC. Built by Brian Alcock (also Hout Bay), for non other than John and Rose Stockwell (also Hout Bay). John chartered her for some years in the Caribbean, before selling her to a guy on the US East coast, who christened her "Sweetwater". She is now owned by a Canadian couple who have been all over the Southern hemisphere with her - including Australia and the Antractic, twice if I am not mistaken. Thats the sort of boat a Vickers 45 is. Basically a small ship you can do anything with . . .
Dudley tells me the Vickers 45 was originally commissioned as a "performance motorsailer". Well if there ever was a term open to interpretation it must be "motorsailer"!! In this context it means "proper fast yacht with a good engine and tankage", and generous accommodations. Well of course the Vickers 45 is a motorsailer. It sails and has a motor just like most yachts. Confusing thing is it sails a hell of a lot better than most yachts - it really has a tremendous perfromance pedigree. As for the motor part, it has a 60-80hp motor, and very adequate fuel tankage. Built in Steel or Aluminium, this really is a go-anywhere vessel, fast and comfortable, and extraordinarily safe. . .
Where did you last see a motorsailer, or any yacht in fact, with a stability curve like this? About two posts back I wrote that the Dix 43 would be my first choice as a cruising yacht, if asked to chose on the spur of the moment. Well in fact the Vickers 45 is really a Dix 43 slightly expanded - it just scales to 45' with no appreciable changes in the ratios. The Dix 43 is a formidable sailing boat - I won't repeat that all here - suffice to say it really is a class leader in contemporary cruising yachts. In fact the Vickers 45 is actually better than the Dix 43 - much of the advantage coming from being slightly larger. So the Vickers 45 is a real performance yacht. In one example the Vickers 45 "Two Jays" beat the Schumacher 41 "Swimlion" over the line between Richards Bay and Durban - notable as Swimlion was a stripped out racer . . .
As they exceed about 38-40', yachts start to become little ships (not including ultra light racing hulls and similar). Suddenly they have real accommodations like a house. They feel safe - and statistically are unlikely to be knocked down. They sail fairly level. They are dry. They tend to be fast enough to make decent passages and they become really useful - for extended cruising, chartering etc - whatever the weather. The Vickers 45 comfortably exceeds in these areas, but as a package, is unique in its sailing performance, comfort and safety. 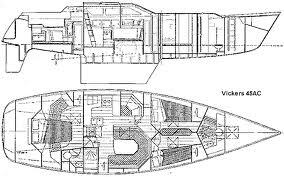 It is interesting to note that a Shearwater 45 would easily fit inside a Vickers 45 hull! This is a large boat at 45'! 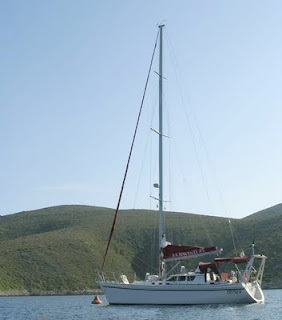 Generous accommodations - large aft cabin, galley and saloon. The centre-cockpit version. It has a 2m shorter mast than the AC version. Keel options include the wing-keel as shown here, with reduced draft. The wings increase the dynamic effectiveness of the keel, and help to concentrate the weight low down like a bulb. On a large hull, this is a sensible option. Dynamically, the Vickers 45 is as good, possibly slightly better in fact, than the others in the Dix range. The signature "Dix hull" as I call it, has a flattish underbody, long waterline, a fine entry in the bow, fairly full stern but moderate beam - this makes for strong performance, limited pitching, and generally good seakindliness. In this example the engine is mounted centrally and entirely below decks - another benefit of size. Generous fuel tankage is in the keel! 500-800 litres depending on the model. The keel is moderate - won't break off, with a good balance between tracking and manouvering in harbour. Plus the weight is well centralised. Rudders can be either semi-balanced on a partial skeg, or full skeg on the steel version. Plans available for Steel, Aluminium, GRP or in fact wood. Rig is Marconi-Cutter. The AC version is 2m taller. ﻿In recent years, as it seems to me, yacht design has focused on either lightweight race boats, or production charter boats. And of course cats. Yachts suitable for circumnavigations, the Southern Ocean, and even the South African coast now seem increasingly rare. We get the odd Halberg Rassy wandering past, some Canadian designs, and the various Roberts designs we see routinely. No offence to them - but full keels with rudders on are getting a bit long in the tooth now. Of the contemporary go-anywhere fast cruisers, the Vickers 45 is clearly a benchmark . . .